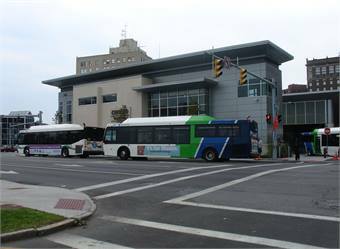 Centro’s $18.8 million state-of-the-art Transit Hub located in downtown Syracuse, N.Y. received Silver Leadership in Energy and Environmental Design (LEED) certification from the United States Green Building Council for its green construction and design. The certification recognizes Centro’s participation in the voluntary LEED green building process and demonstrates the agency’s leadership, innovation, environmental stewardship, and social responsibility. 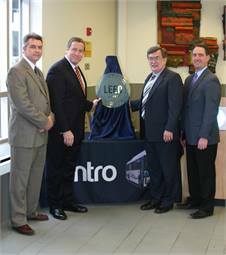 From left to right: David Harding, partner with QPK Design of Syracuse;Rick Fedrizzi, USGBC president/CEO and founding chair; Frank Kobliski, Centro executive director; and Matt Millea, deputy county executive for physical services at a presentation recently held to celebrate Centro's The Hub reaching LEED certification. Heated bus platforms and sidewalks that utilize radiant heat to prevent icing and snow build-up. A storm water infiltration system that captures rainwater and removes particulates via a hydrodynamic device prevents the need for treatment at a sewage plant and reduces taxpayer costs. Funding for this project component was provided by Onondaga County’s “Save the Rain” program. LED overhead lights with automatic brightness sensors maintain uniform lighting throughout the Hub, and sensors turn lights on and off throughout the day and night depending on needs. A 55,000-square-foot roof canopy above the center platform contains skylights to allow in natural sunlight. An energy management system that automatically controls heat, cooling, and lighting based on current conditions and occupancy. Low flow plumbing fixtures that contribute to a 32% reduction in water use.